Bolotnaya case defendant Buchenkov released from jail, put under house arrest | Russian Legal Information Agency (RAPSI). 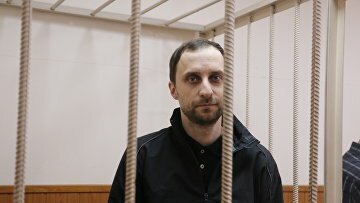 MOSCOW, March 2 (RAPSI) – The Moscow City Court on Thursday replaced detention of Dmitry Buchenkov, who stands charged with participation in the riots on Bolotnaya Square on May 6, 2012, with the house arrest, RAPSI learnt in the court’s press office. The court therefore granted the defense lawyers’ motion and dismissed investigator’s request seeking extension of the defendant’s detention. Buchenkov is placed under house arrest until May 6. In October, final charges were brought against the defendant. He stands accused of participating in mass riots and attacking persons in a position of authority. There are 6 charge counts and 7 victims in the case against him, his lawyer Svetlana Sidorkina told RAPSI earlier. Buchenkov pleaded not guilty. His defense insisted that he was out of Moscow on the day of riots. According to attorneys, Buchenkov has an alibi. Investigation into the case was extended until May 10. Over 400 people were arrested and scores were injured in the authorized Bolotnaya Square protest that turned violent in May 2012. Dozens were later charged with inciting mass riots and battery against law enforcement officers. Riot organizers Leonid Razvozzhayev and Sergey Udaltsov were sentenced to 4.5 years in prison each. Other defendants in the case received prison terms ranging from suspended sentences to four years. Several defendants were pardoned; one is undergoing compulsory mental treatment. 15:42 02/03/2017 The Moscow City Court on Thursday replaced detention of Dmitry Buchenkov, who stands charged with participation in the riots on Bolotnaya Square on May 6, 2012, with the house arrest.